Every good analytics platform should give you the opportunity to share data anytime and with anyone you need. After all, the point of the tool is to ensure that all interested parties can make informed decisions based on quantitative data. That’s why we’ve designed Piwik PRO to let you export data in multiple ways and various formats. The list includes data spreadsheets, PDFs, images, xmls, php/json and even RSS. Also, we’ve given you the capacity to set up periodical reports delivered automatically to a preset list of email addresses, so your stakeholders get them right on time. 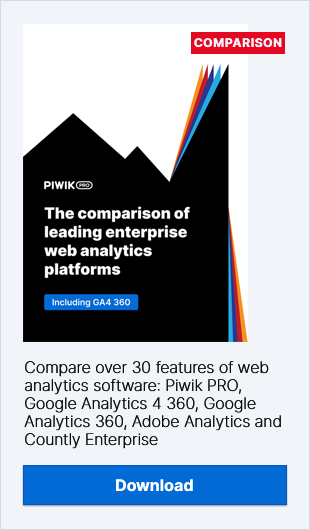 In this blog post we want to walk you through all the possibilities for sharing, exporting and sending reports and dashboards in Piwik PRO Analytics, Custom Reports and Customer Data Platform. Let’s get started! One piece of advice: The most versatile data format in that case would be a CSV file. The format can be used in a vast array of tools, so you’ll be able to apply data to perform deeper analyses. As for developers and hard users, exporting to PHP or JSON files could be very convenient, as this type of file can be used for any custom implementation using analytical data from Piwik PRO. Next, let’s discuss sending personalized reports and dashboards via email. You’ll configure them by going to Analytics settings and clicking on the Email Reports tab. From there, you’ll be able to create a scheduled periodical report to be delivered to specific email addresses. You can choose from many different options depending on the configuration of your web analytics instance (e.g. defined goals). If the test shows that everything works as it should – that’s it, the configuration is complete. Want more? You can get more! A new addition to our stack – Piwik PRO Custom Reports – offers even more options for exporting and sharing data. Each report created in Custom Reports gives you the ability to export not only reports as a whole, but also charts and tables individually. Then, you specify the report type. As in the previous examples, you can choose from several formats – CSV, XML or JSON. A useful option, especially in the case of long and extensive reports, is limiting the number of rows of exported data. Using this feature, you can make sure that the exported files contain only the juiciest and most relevant pieces of information. Additionally, you can easily save a particular view of data as an image (e.g. to include it in the presentation deck) or as a PDF file. Quite useful, wouldn’t you say? Analytics is not the only part of our Suite that allows for data exports. Data can be also easily fetched from our Customer Data Platform. This will be useful if, for example, you want to export audiences and upload them into another tool. Also, you can always decide to dump all the attributes available into a database to run some deeper analyses. As you can see, there are a lot of options for exporting and sharing data in Piwik PRO. We’ve gone the extra mile to give you practically unlimited possibilities for using this information in other tools. We hope that we’ve explained this issue in the most concise and simple way possible. However, if you have any questions – don’t hesitate to contact us! Our team will be happy to fill you in on the details.